When I first moved to Seattle in the early 80s, I may have taken up residence in Pioneer Square, but I ate in Pike Place Market. A quick trip on the free-zone bus would land me at First and Pike, and a mere brioche’s throw from my favorite bakery: Au Gavorche. It was there that I first discovered Pomme Gavorche, a crust-entombed apple the size of a slow-pitch softball stuffed with raisins, spices and custard. I marveled that the young cashier could lift it over the counter without a winch. Years later, and an island away, I came up with an apple dumpling recipe that’s easy to make (and lift) and equally delicious. Serve with ice cream or my favorite, Creme Anglaise. 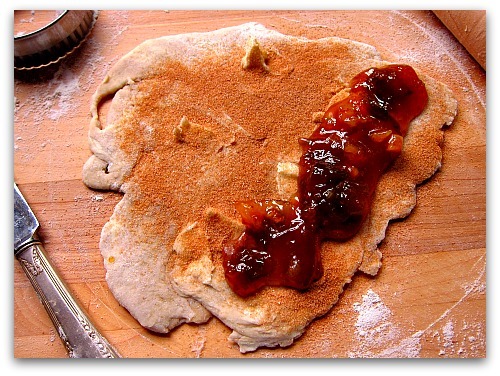 Delicious byproduct: Should you have leftover dough, dot it with butter, sprinkle with cinnamon sugar, and spread jam on one side. Roll it up like a log, cut into wheels and bake! Update: My Favorite Seattle Bakeries, all amazingly good! That’s beautiful. I had a bad experience with a new apple pie recipe this weekend– I’ll have to make your dumplings and let the apple redeem itself. Oooohh, something to do with my leftover pie crust besides empanadas or the chicken-food basket. Great idea. Tom, I really enjoy your website! I live in Tacoma and if I stood on my roof I’d be able to see Vashon. My husband and I were motorcycling on the Island a few weeks ago and we flew past your place without even realizing it! Good luck to you my friend – and how should I prepare this year’s Thanksgiving turkey?? How gorgeous and delicious too. I want some now! This would make a great dessert anytime….but also a wonderful dessert for Thanksgiving. Thanks for sharing Tom! I’ve been enjoying your articles on apples, and have learned quite a lot more about heirloom apples by researching some of the websites you suggested in your last post. We have a beautiful golden delicious apple tree and I’ve made pie, strudel, apple challah, and tarte tatin so far. Next up will be these dumplings. Thanks so much! omg…you have the best treat ideas! I think even I may be able to pull these off! Yummy! How delicious makes my mouth water!! I smell a cross promotion coming on… Tall Clover Farm… Tall Grass Bakery… Tall Clover Bakery… Tall Grass Farm… HMMMM? Either way – these look delicious! I may have to try my hand at this for Thanksgiving… Trying to get together a bunch of no-fuss desserts that’ll be easy for me to co-mingle with a crowd of fussy eaters… Thank you SO much Tom! Beautiful Tom. 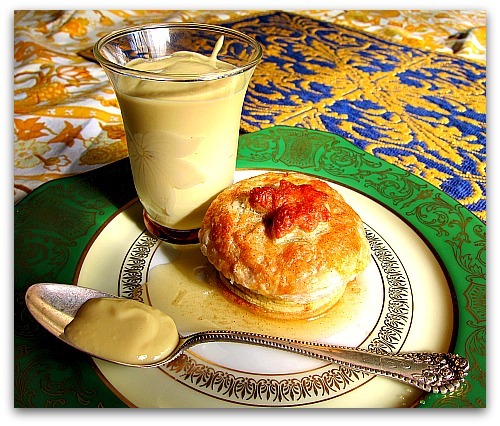 Simply beautiful – I’d go for the creme anglaise too. Can’t wait to make these gorgeous pommes. I did not know you were such an expert baker! this apple dumpling is adorable! Oh my goodness, Tom! This looks divine. 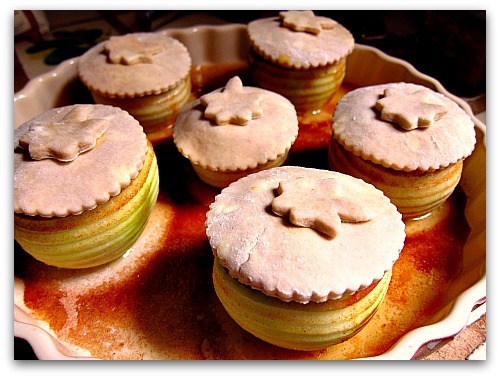 wonderful for the holiday season, with the cute apple chapeau dressing up this treat. with so many good eating and baking apples around why are thy impossible to find in the big city (dallas)? Margaret: Love Tacoma, The City of Destiny! Thanks for the introduction and the visit to my blog and island! As for the turkey, let me think about that. Cate: Golden Delicious are great apples, in fact they were the go-to baking apple for Julia Childs, maybe I need one in my orchard. Roberta, thank you, I’m blushing, but I’ve got a list of foibles that will take me out of the running for that title. Donna, one would think I’m pulling a fast one, but nope, no connection to Tall Grass Bakery. And for the record, they make the best hazelnut shortbread cookie in the city. Thanks Chris, Ina, Shirley, pAMELA, June, Joumana, and Stevie! Brion, produce availability is all about demand. What we don’t know about, farmers won’t produce. Unfortunately the unfamiliar doesn’t sell. For instance, while a Bartlett pear is good, a Comice pear is amazing and Seckel is a downright sugar bomb. You’ll be hard pressed to find the later two, because they are unfamiliar to most consumers. As consumers become more aware and in tune with some of the great apples, pears and produce available, you’ll begin to see them on the shelves (the produce that is). It is improving, thanks to Americans’ renewed interest in food variety, healthy eating, and heirloom varieties. Oh! Tom this is exactly what I needed. Since I didn’t want to make an apple pie the alternative of just placing a cap sounds really appealing. I am taking this recipe with me for this Sunday dessert. Oh this has got to be one of the most unique deliscious fall creations I have seen – I am especially game for the ‘chapeau’ seeing how my dad wears one everyday of his life! The flavors are lovely and very very pretty presentation it does make. LOVE IT! Dear Tom, they are excellent. We like things, made with apples. I’ll try both dumpling and creme anglaise. Thank you. Tom, these are gorgeous! 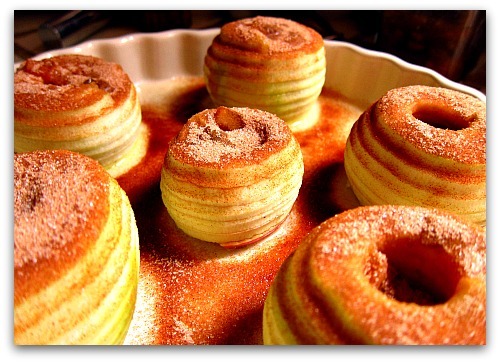 Apple farm visits are in my future and I am going to have to make these. Have several dinners with friends planned in the next few weeks and these will be perfect! Thanks Mely, Devaki, and sare; and JoanneNicole, thank you for the laugh. I still chuckle every time I read your comment, Nun’s farts, you don’t say. Not surprisingly, in French ‘Pets de Nonne’ sounds so lyrical and lovely. 😉 I think we should keep this secret from the sisters. Eileen is a dinner invitation from you and yours the hottest ticket in town? I tell you, I’d be leaving flowers and jam jars on your door step. These look so beautiful. Did you somehow score the outside of the apple? The photo seems to indicate concentric rings. Tom S, those apples are cored, sliced and peeled by the best gadget of American ingenuity: the hand turned apple peeler. It cuts little grooves in the apple as it peels it. I see a blog post in the making. Thank you, Tom, for this delicious dessert recipe of your own creation! 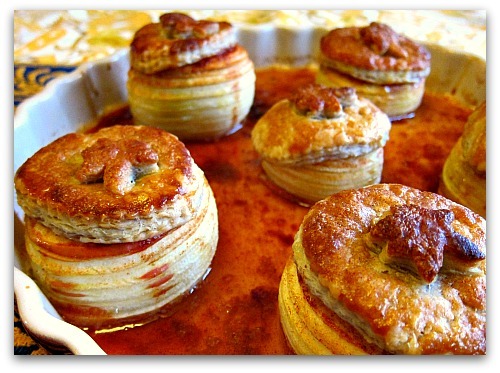 I will be trying this very soon with some of our heirloom Fameuse apples! Also, thank you for your encouraging words and advice on my blog about my Sweet Meat Squash! I have them tucked away in a hay lined box in our barn. We’ll see if any survive until Easter! Oh MY! Pie dough, you say? Apples you say? I’m on it. Those are GORGEOUS! I sort of thought you were using a hand turned apple peeler. It really makes a great presentation for this recipe. And, you know, somewhere out in my garage–tucked in a box of things I got from my grandmother years ago–I have one of those peelers. I’m going to find it today cause I just got a load of apples from my neighbor’s tree. Hi Tom, All this talk of apples has inspired me to make applesauce. Well, guess who I found commenting on Epicurious.com’s Three Apple Applesauce…Farmer Tom! Since you started me on this whole project, and you’re clearly haunting my internet search, what’s your favorite recipe? Stephanie, great question, I’ll make some applesauce today and post the pics and recipe hopefully by Sunday. But if you can’t wait for that, the epicurious recipe for 3-apple applesauce is good, but leave out the water and leave out the salt. I tend to add apple cider or juice to the mash, for better flavor. I also keep it pretty chunky and only add 1/2 cup of sugar or based on taste or my preference at time of cooking. You don’t need to mash anything, just a very slow cook, will soften the apples sufficiently, some won’t. If you like a bit of crunch, add diced Granny Smiths toward the end — that’s what I do actually using Bramley’s Seedling apples which are wonderfully crisp and tart. Good luck! Tom: You mentioned marmalade in the list of ingredients without specifying the kind of marmalade. Did you mean orange marmalade? The recipe sounds great, and we are going to try it with apples with just picked. Hi Jonathan, yep orange marmalade is a nice compliment to the apples, seems to add a brightness to the whole thing, a kick of tartness if you use lemon marmalade. I’ve also used fig jam and gooseberry jam, and pineapple jam. Thanks, Tom for this superb delicacy! This dessert is truly a winner! I love all of the stuffings inside of the apples! the pie crust on top looks justy stunning!!! Tom! We made this recipe last night, and it was fantastic! We were missing a few things, but decided to forge ahead with whatever we could find in our kitchen. We used lemon curd in place of the marmalade, dried cranberries for the raisins, almonds instead of walnuts, and puff pastry in place of pie crust. I’m excited to try the real deal next time! Go Roz, go! I think your version sounds pretty awesome indeed!